I am so excited to be a part of the Scrapbooking Global blog hop for the second month in a row. I love being a part of this amazing community. One of my goals is to make scrapbooking a priority this year. 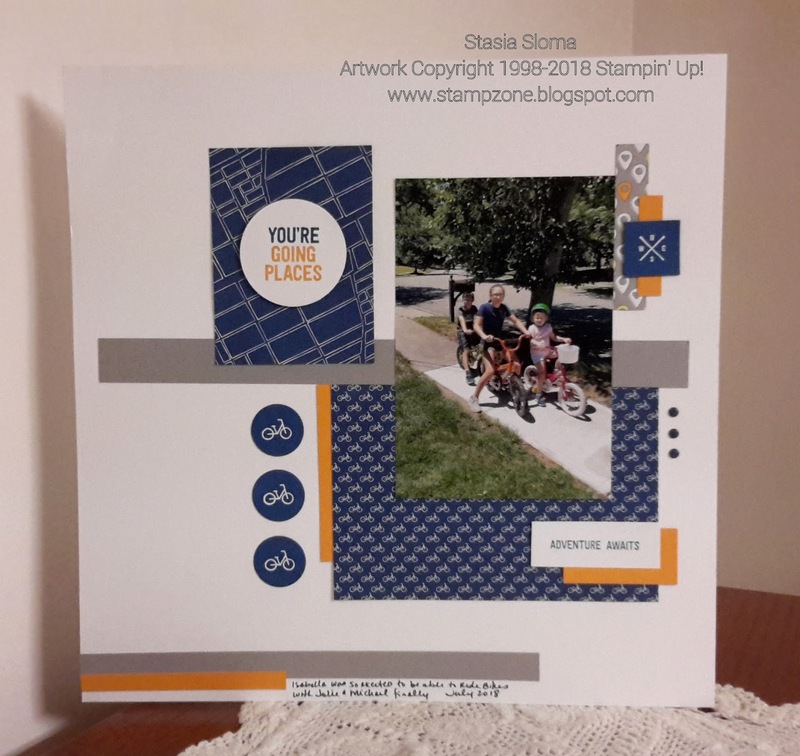 One of the best things about the Scrapbooking Global - Stampin Up! Facebook group is that anyone can join. The only thing is that they ask that you only use Stampin' Up! products. We know we have amazing products but sometimes we focus on the card making and forget that we can make some pretty amazing pages with our collections. This month the theme of the hope is Memories and More. On pages 194-196 of the catalog is our Memories & More collection. Now I don't own the the Best Route Memories & More Card Pack, but I decided to use it as inspiration and make my own memory cards. I made a 3x4 and 4x6 memory card with the Best Route designer series paper and En Route stamp set. I added additional elements with strips of card stock, embossed stamp images punched out and some retired candy dots and the page came together. Here is my niece who was so excited to be joining her big cousins on a bike ride. She just learned to ride without training wheels. I love the En Route suite, it is perfect for scrapbooking memories. If you are hopping along, you should be coming from Cheryl Taylor (UK) blog. The next stop in the hop is Lisa Henderson . Thank you for stopping by. Here is the list for the blog hop. I Love that Stampin' Up! have such AMAZING co-ordinating products that you don't NEED to have everything in the catalogue EVEN though you want it ALL!!! Thank you Stasia for Hopping along with us again this month <3 It truly is a great way to showcase so many different styles from all the talented artists throughout the world. The theme you have wonderfully implemented. Photo and design fit together exactly. You really captured the moment in the photo. It's a simple thing, a bike ride, and a simple layout with a great theme. Well done.